Thanks mainly to stellar attendance for Hollywood-made films, China’s box office racked up growth of 41 percent (as measured in US dollars) for the first half of 2012, with aggregate ticket sales of more than $1.25 billion through the weekend ending July 1. If China’s usual annual pattern of higher second-half ticket sales holds this year, the July-December period will account for around 60 percent of total revenue, and the year-end tally will exceed $3 billion. China’s revenue growth continues to dwarf that of the U.S. and most other international territories. 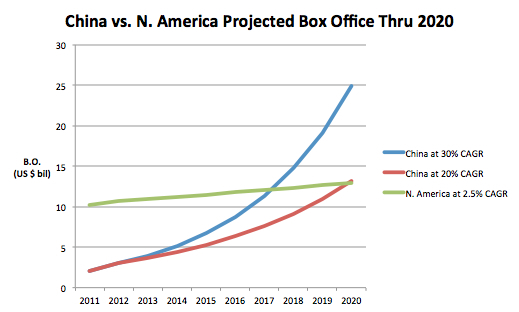 Even if the PRC’s blistering growth cools to just half of its current pace, it will supplant North America as the world’s largest box office market by 2020. Note: India is excluded due to lack of reliable data. Through the end of June, 2012, 8 films crossed the $40 million box office threshold, as many as reached that level in all of 2011. 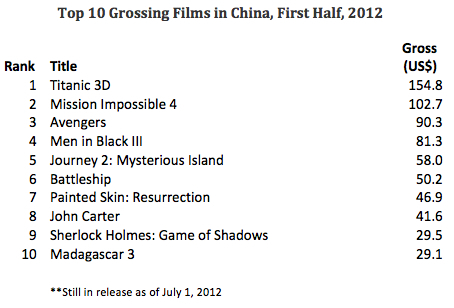 Only one non-Hollywood picture, the Hong Kong-China co-production Painted Skin: The Resurrection, cracked the top 10 films, at number 7. Foreign films took more than two-thirds of all ticket revenue, a first-half record, and for 23 straight weeks from mid-January through late-June, Hollywood films topped the charts. But Chinese films will likely regain share in the second half, with Painted Skin 2 continuing its record-breaking run, and such highly anticipated releases as Feng Xiaogang’s 1942, Wong Kar-wai’s The Grandmaster and writer-director-producer-star Jackie Chan’s Chinese Zodiac coming to Chinese theaters later this year. Action and adventure remain the top drawing genres, with more than 40 percent of revenues. But romance surpassed science fiction as the second most popular genre, as several love stories, most notably Titanic and Painted Skin 2, drew large numbers of moviegoers to theaters. Animation’s share has dropped from 15 percent in 2011, when Kung Fu Panda 2 set records and some very tough comps, to just 7 percent so far in 2012. 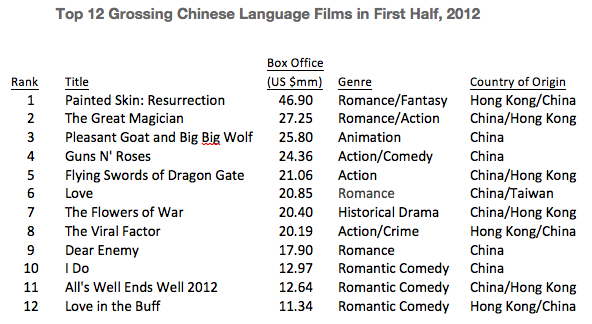 Two unmistakable trends in 2012 are the emergence of the female moviegoing audience as a major force in China, and the failure of Chinese filmmakers to connect with their own domestic audience. 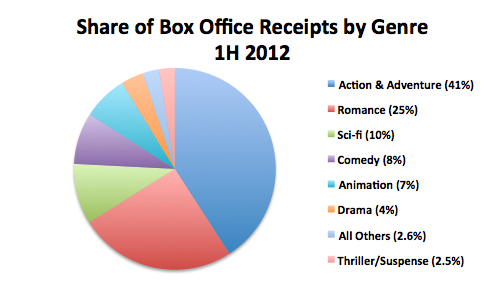 Romances and romantic comedies captured 28 percent of ticket sales in the first half of 2012, up from just 7 percent in 2011. Even if we take the outlier Titanic 3D out of the mix, romance/romantic comedies still more than doubled their market share in 2012. 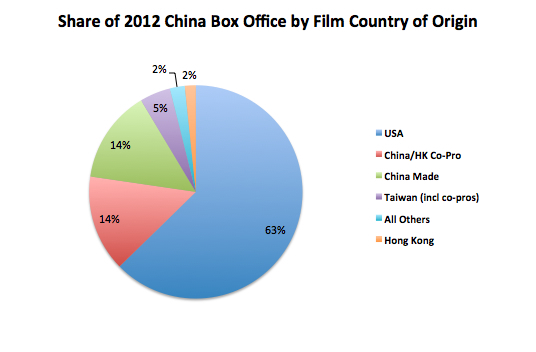 Domestic Chinese films (excluding co-pros), lost nearly half their market share, dropping from 25 percent in 2011 to just 14 percent in the first 6 months of 2012. The challenge for Chinese filmmakers is simple: make better movies, target them better to the tastes of Chinese audiences, and do a better job of marketing them. China is and will remain the greatest growth opportunity for producers worldwide. Everyone should study the success of Painted Skin: The Resurrection, and the rest of the top-grossing Chinese language films, for lessons about what Chinese audiences want. This entry was posted in Analysis, Box Office Reports, Opinion and tagged Animation in China, China box office, China box office share by country, China box office share by genre, Painted Skin 2, Rob Cain, Robert Cain, Titanic 3D by chinafilmbiz. Bookmark the permalink. Very informative, as usual. And is important to realize that the number of high-quality cinemas in China will grow as well, thus giving film makers more venues. But can they connect with Chinese audiences while at the same time making films with a global appeal? The answer should come within the next 3-5 years. I agree with Kent, makes for really interesting reading for all those with an eye on the market. Too bad China doesn’t pay the same rate as other countries…our film distributor after having a great Berlin & Cannes showing with our film was not able to secure foreign presales with China – China came in @ less than 1/2 of what Spain & Greece paid. Could it be that the China Cinema market does not generally go for the Berlin/Cannes style movie? Fabulous summary snapshots you always provide Robert. Interesting the changes in what genres are popular. I note that Family Genre, which is the dominant genre in the Top 100 movies of all time, doesn’t quite make it as its own genre in China, but is absorbed as part of others. It seems that a family outing to the cinema in China is still a rare occurrence and Family Genre movies seem to be marketed as Action-Adventure. Will be interesting to see how the China market develops. Mario, the family movie outing is far less common in China than it is in the U.S. Aside from a few well established franchises like “Pleasant Goat and Big Big Wolf,” there aren’t many movies targeted at family audiences, and those that are tend not to perform well. Very interesting article and blog. But for my part I take more importance on language than countries, I would have made a chart ranking by language and not countries. It seems English is even more important (US+UK+AUS), then Chinese, then maybe French (France+Belgium+Switzerland+Quebec), Spanish (Spain+Latin America) and German and Russian.